The Mabole Malay Association held its 33rd Annual General Meeting at the Wattala Town Hall on 29th April 2017, and Saudara M.D. (Tony) Saldin was elected President for the year 2017/2018. 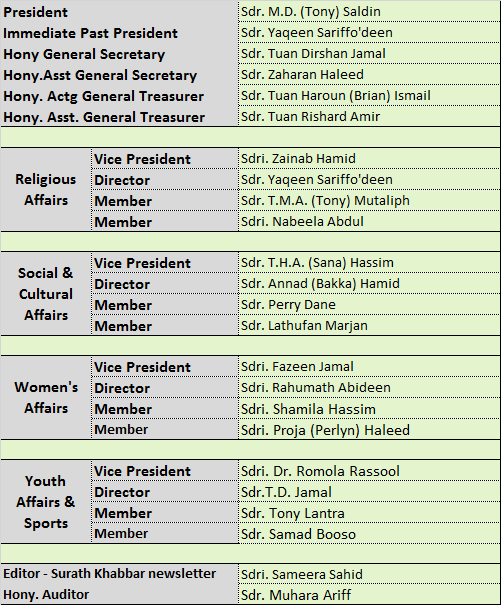 Following office bearers were duly elected for the year 2017/2018. Dr. Azad Uduman, Chairman/Managing Director, Atamie International School was the Chief Guest with Sdr. Rilwan Lantra, Secretary General – Sri Lanka Malay Confederation (SLAMAC) and Colonel Mahamoor Rajudin, Past Secretary General, SLAMAC as Guests of honor. It was time for the membership to interact and network with each other, in a Spirit of camaraderie and friendship. The youth members also took part in various competitions organized by the Subcommittee headed by Sdr. Sana Hassim and assisted by Sdri. Zainab Hameed.